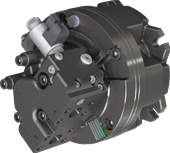 The SAI Radial Piston Hydraulic Motor is of the eccentric crankshaft design with swivelling cylinders. This design of motor enables very high efficiencies to be achieved and gives exceptional performance. They are available in fixed, dual and variable displacement versions covering a wide range of displacements and powers. 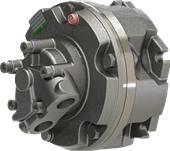 A range of displacements within each motor series, together with a range of shaft and distributor options, allows SAI to offer motors that are exactly suited to the application requirements. Fixed displacement motors are available in standard GM, L, P and TF Series or high speed formats GS and S Series. 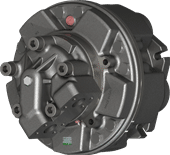 Dual Displacement Motors are available in BD (Five Cylinder) and TD (Seven Cylinder Heavy Duty) versions. Displacement ratios between maximum and minimum can vary from 2:1 to 4:1. These are available in BV (Five Cylinder) and TV (Seven Cylinder Heavy Duty) versions. High efficiency is maintained even in minimum displacement, which can go as low as zero.